Festive Hawaiian Gingerbread Village at the Sheraton Princess Kaiulani Hotel. 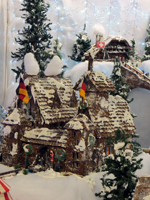 Holiday Gingerbread Village: for Viewing NOT Eating! 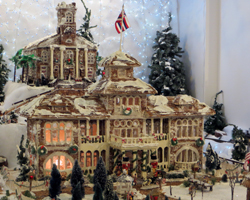 I admit that a snow-capped holiday gingerbread village is just about the last thing I would ever expect to find on a Hawaii vacation, but that’s precisely what makes this one-of-a-kind Hawaii attraction so fantastic! You can stroll off the beach and into the open-air lobby of Waikiki’s Sheraton Princess Kaiulani Hotel, and there it is… a frosted fantasy world literally filling nearly half of the hotel lobby! Wow! Now I don’t know if you’ve ever made a gingerbread house before, but even with those kits you can buy at the store, it’s a lot of work just to get one shoddy structure of questionable artistic value. 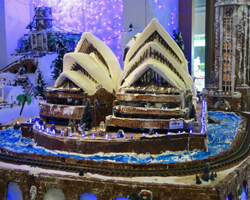 In contrast, every December at the Sheraton Princess Kaiulani Hotel, executive chef Ralf Bauer’s incredible Hawaii and international gingerbread village is everything you imagine you’ll make – plus a thousand times more! Approximately 300 square feet of lobby space. 250 gallons of snowy-white icing. 150 pounds of dark chocolate. 50 pounds of white chocolate. Moving trains, ski lifts, amusement park rides, ice skaters, and more. Basically, the photos tell you more than my words ever could. 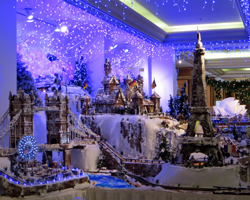 Nevertheless, I’ll do my best to help you form a mental image of the sugary wonderland sprawling out in front of me! 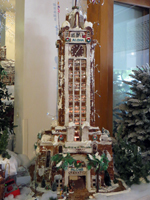 When I last went to this Hawaii activity, I started my gingerbread world tour at Hawaii’s own Aloha Tower and Iolani Palace. Then I made my way around to the Hawaii governor’s mansion and Kawaiahao Church. 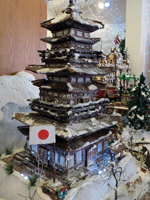 After that, my sightseeing adventure took me to a delicious-looking Japanese pagoda, Washington DC, the Eiffel Tower, a German ski village, and London! This display opens approximately December 1st and remains open until the day after New Year. 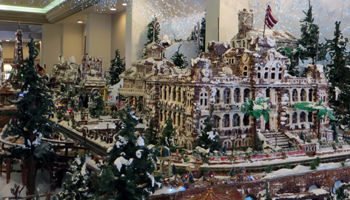 If you’re in Hawaii at that time, I would definitely recommend taking a few minutes to swing by the Sheraton Princess Kaiulani Hotel so that you too can gawk in wonder at the unlikely but amazing holiday gingerbread village.